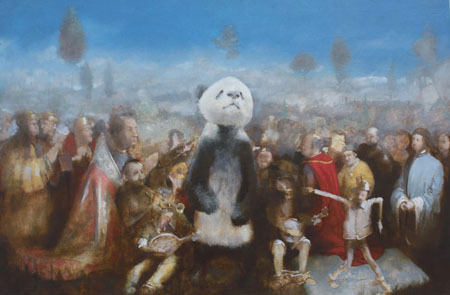 The Day King Fluff Came Home by Philip Lindey. THE INIMITABLE Philip Lindey unveils an exhibition of new paintings at Salthill’s Norman Villa gallery tomorrow evening. This is a show that promises the exotic, a journey to lands that presumably don’t exist. This is a travelogue with the scent of jasmine in its hair. There are monkeys playing trumpets, submarines being hijacked, kids surfing on pallets in mid-Pacific flotsam. This is a whirlwind spin around the world without any regard for health, wealth, safety, or the truth. The title of the show is Proving The World To Be Flat and, over an afternoon coffee, Lindey explained the inspiration and ideas behind it. “I was re-reading Around the World in Eighty Days and that was the initial starting point, that concept of a journey,” he reveals. “But very early in the process the whole narrative just fell apart into a bunch of little vignettes and I asked myself whether I needed to thread them together and decided no, I would let people do that for themselves. That combination of the real or the specific with the fanciful or illusory informs and animates many of the paintings, such as the one entitled Dreams of Old Ireland which depicts Eamon deValera and John Charles McQuaid and what Lindey chucklingly describes as “some sort of weird rapture going on in the background”. The illusory or ‘unreliable’ aspects of the paintings also arise from their perspective as well as the narrative elements. “Something I’ve always liked in paintings is a kind of unjudgable distance,” says Lindey. “There’s this kind of haze that things kind of disappear into, but even things in the foreground here aren’t really well described enough to be trustworthy. Lindey also makes a nod to Velazquez in the painting Riding Into Town On My Pretend Horse which depicts a human rider astride a horse the size of a small dog. While Lindey’s viewers are “being lied to” as he puts it, they are also being entertained, delighted, and provided with much food for thought in what is a captivating show. Proving The World To Be Flat continues at the Norman Villa until October 23.